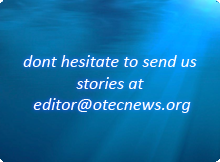 Okinawa Prefecture has announced the start of the OTEC operation test at Kume Island on April 15th. The main aim is to examine the expected fluctuation of electricity supply caused by changes in weather, season, and sea temperature. The testing and research will be conducted with the support of Saga University until the end of 2014.
rritory of the Okinawa Prefectural Deep Sea Water Research Center. 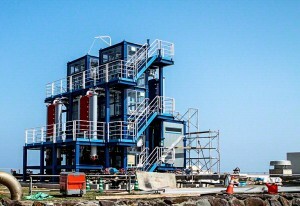 The plant installation was finished in March and the first trial run was held on the 30th of March. The location was specifically chosen in order to utilize the existing intake pipe developed by the research center. The pipe had been used in the past for the intake of deep sea water for fishery and agricultural use. In Okinawa, the surface water temperature is around 25-30 degrees, and 8-10 degrees at 600m depth. In order to effectively transmit the heat, alternative CFC (adjusted to reach the boiling point at 24 degrees Celsius) will be used as heating medium. “OTEC is a stable method to generate electricity, and we would like to have it as a stable source of electricity for residential and industrial districts. We are planning to increase the size of the electricity generator, as well as commercializing it in the future.” as stated by the Industrial Policy Division of Okinawa Prefecture. With regards to the future commercialization, Okinawa Prefecture is also investigating possible synergies using the deep sea water for fisheries and agricultural use. Last October, Emperor Akihito and Empress Michiko visited the institute to learn about the OTEC plant.